Wild fact: She has two books coming out this fall that have been in production for five and ten years! She says these are exceptions, most books take a year or two. At Little Brown, there are two book seasons, and each have pretty standard deadlines for art. These are standard schedule dates in the LB contract an illustrator receives! I might have to lie down. Changes to the schedule can be made, but an illustrator must tell their editor/art director production team as soon as possible if they need more time. Trim size is chosen, as are paper types (dependent on book age range and category) and pagination lengths. Saho is looking for character and setting consistency at the sketch stage to be sure those are consistent in the final art. Even at the sketch stage when there may be no color, Saho is aware of potential issues, for example, when working on Jerry Pinkney’s TORTOISE AND THE HARE, Jerry had mentioned he wanted the story set in the dessert. But the art team expressed concern the pages would be monochromatic, and that the main characters would blend into the background too much. 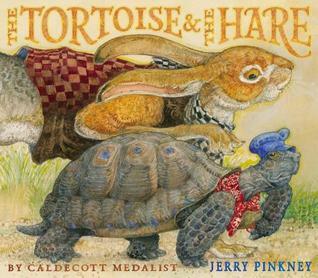 So Jerry added colorful props and accessories to the tortoise and hare, as well as colorful, extra cast members to help vary the palette more.